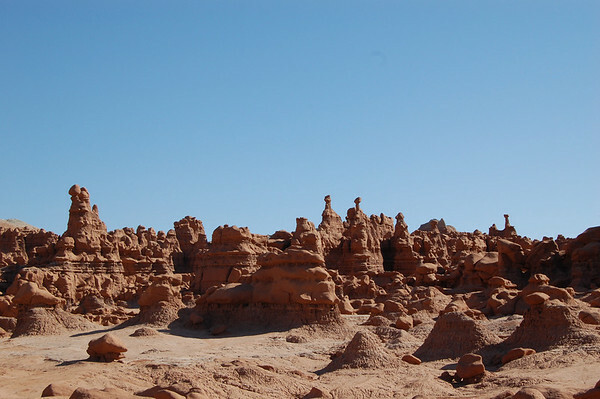 While campground hosting at Arches National Park, we decided to make the 120 mile drive to Goblin Valley State Park. 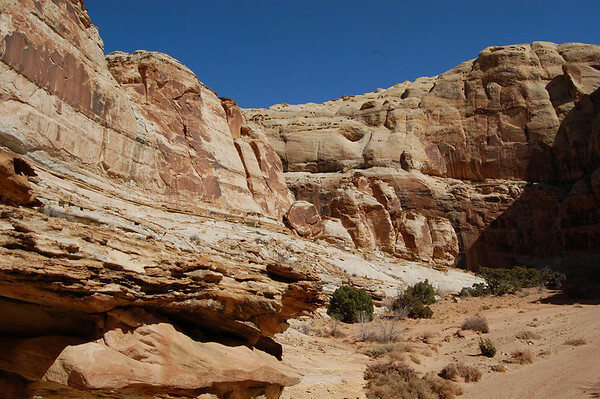 It's about 40 miles from I-70 off of Utah Hwy 24. Yep, it's out in the middle of nowhere. We left a little before 8:00 a.m. and arrived around 10:00. 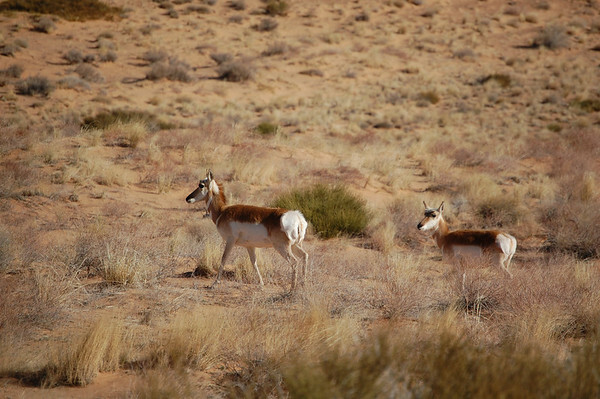 We encountered a small herd of Pronghorn Antelope on the way. 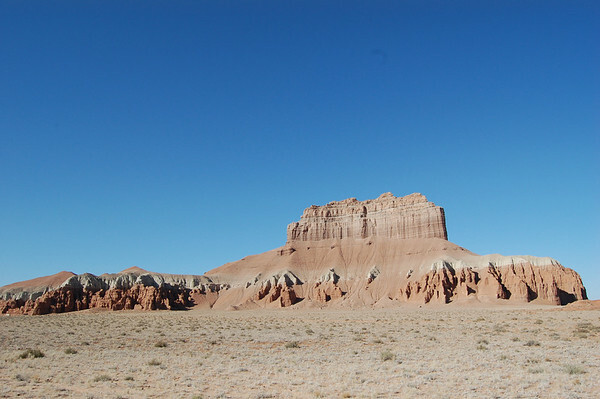 As we entered the park, we were faced with this red rock monument known as Wild Horse Butte. We paid our $7 entrance fee, got our park brochure, and drove on into the park. 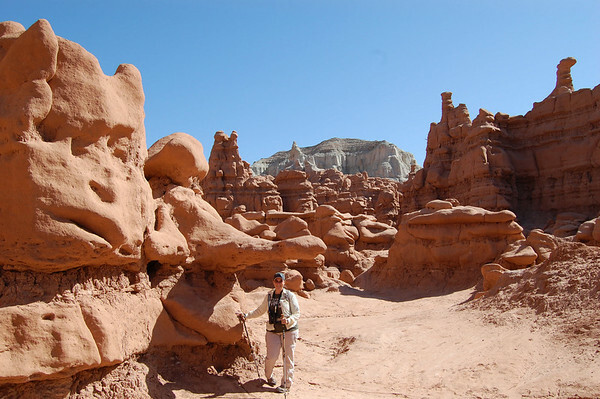 There are three hiking trails in the park, but most people head straight for the Valley of Goblins. There we parked in the large parking area next to an observation deck with several picnic tables. The sun was rising over the valley, so the photos from the observation deck weren't great. But we've still got plenty of others. 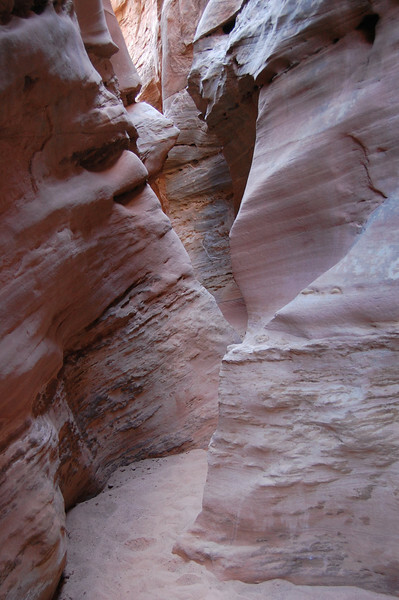 We started down what is referred to in the brochure as the Carmel Canyon Trail. 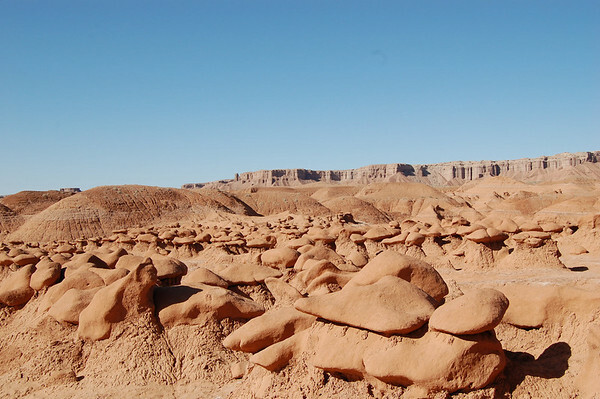 But once down on the desert floor with the hundreds of mushroom looking formations, it's difficult to determine where the trail is supposed to go. There are trails everywhere and it's sort of an "anything goes" kind of place. 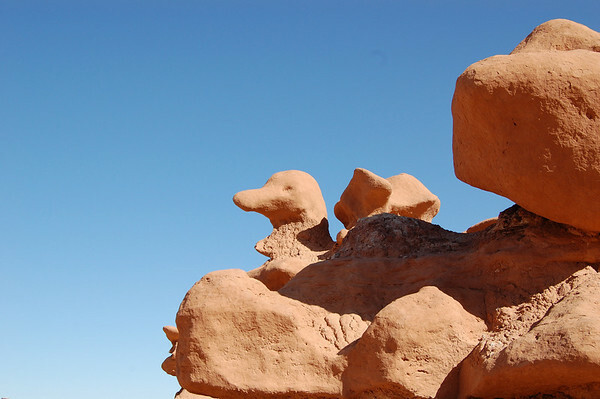 Though there is a rule against defacing any of the rocks or formations, there are no rules on where you can walk or climb. 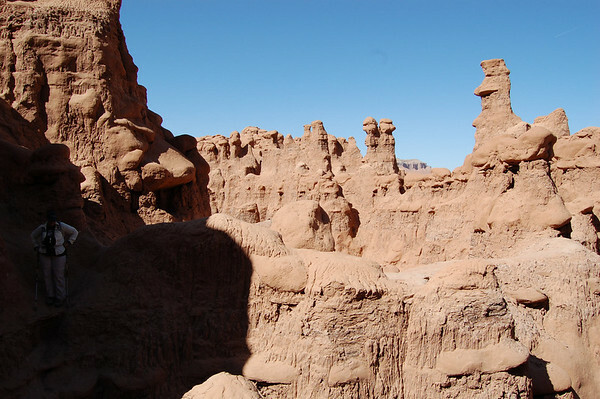 There is little vegetation and no remaining cryptobiotic crust which is highly protected in the area national parks and monuments. 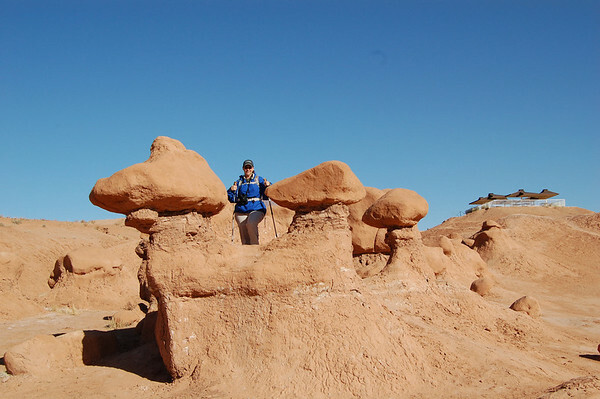 But that's what makes Goblin Valley so much fun for kids of all ages - no rules and unlimited exploring possibilities. A truckload of teenagers arrived and yelled "Look at our playground!" Us big kids joined right in, though we did go in the opposite direction. Here's a shot of Linda with a couple of the "mushrooms" and the observation deck in the background on the right. A view from the top of a large mound in the middle of the goblins. 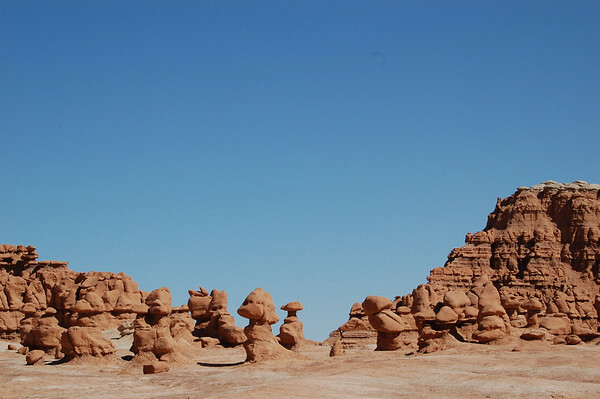 A view in the opposite direction looking over the Entrada Sandstone goblin formations toward the Henry Mountains far in the background. 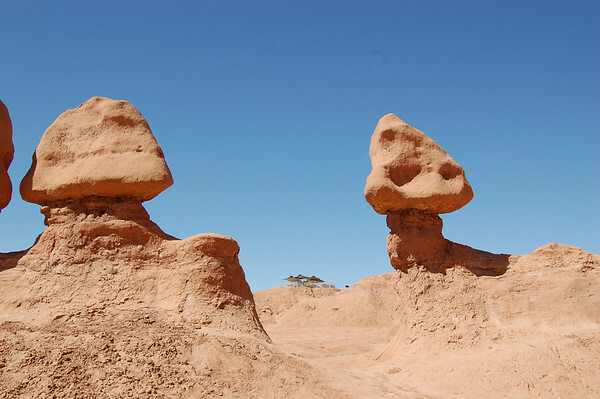 Though most of the little formations look like mushrooms to me, a few seems to have personalities and features. 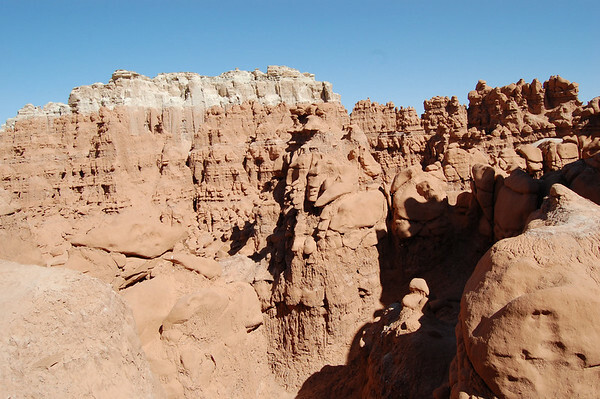 There are actually three valleys of goblins and you could spend hours or days exploring all of them. But it doesn't take long for the small formations to start looking like more of the same. 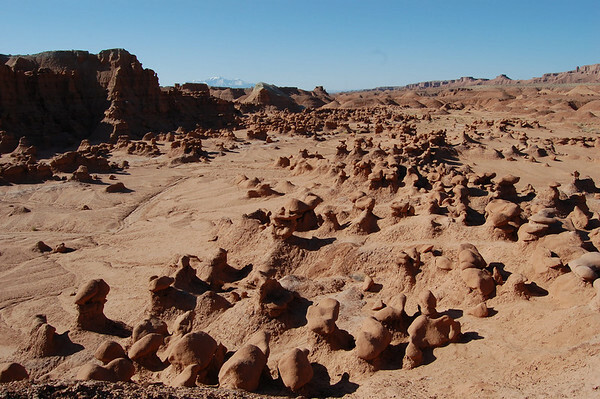 However, there are lots of mounds and canyons and rocks in addition to the goblins for which the park is named. Linda & I walked, hiked, and scrambled up through the rocks. Though there doesn't seem to be any place that hasn't had a lot of traffic, we were able to find some secluded spots (at least for a Monday in mid-March) with good views. Eventually, we would always end up back on the main floor of the valley among the smaller goblins. But even the smaller goblins were much taller than us. 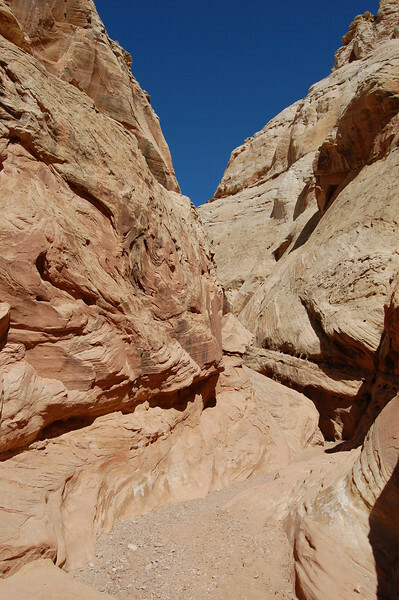 We managed to find a canyon wash and hiked up. It was pretty cool back in there. We came to what looked like a dead end, but with a little effort, we were able to make our way through some tight spots and up amongst the taller rocks. However, we became faced with a dilemma. We either had to turn around and go back or figure out how to lower ourselves down a steep drop-off and see if it led to an exit. Knowing full well my distaste for ledges, Linda left the decision up to me. Well, I may not like the potential pain of falling, but I'm still an explorer at heart. 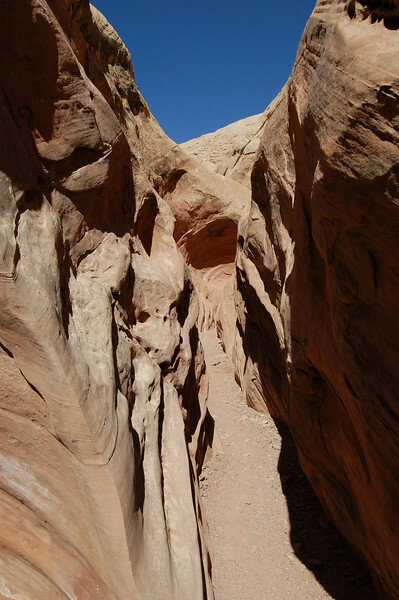 So, after assessing the situation, we slowly climbed down into the deep wash.
Of course, we didn't know exactly how we were going to get out if that led to another dead end. Whew. We made it through that section. Then we found another challenge, but at least the views were worth it. Linda's over on the left in the shadows getting ready to follow my lead. We finally made our way out. That was fun! Back down among the goblins and mushrooms. We decided to head back to the Jeep before we wore ourselves out. We still had another hike to do. 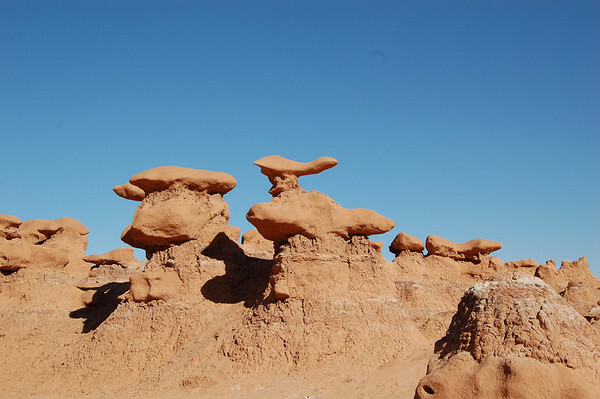 One last shot of some formations with the observation deck in between. We decided to skip the other two hikes in the park, but we wanted to check out the campground before we left. 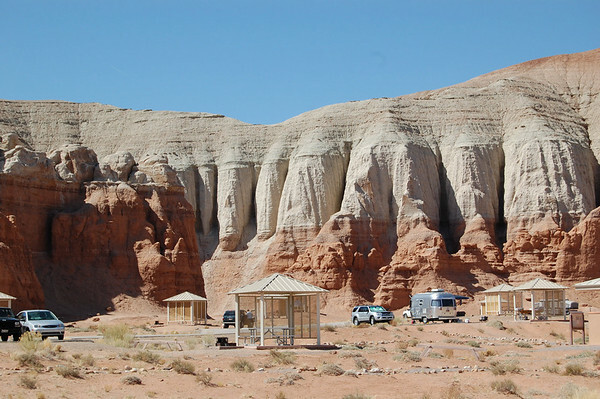 The campground is small with 21 RV sites. But it is a pretty cool campground and several of the sites are large enough for big rigs even though the website says "Max RV Length - 30". There is a bathhouse with showers and flush toilets. No hook-ups, but there is a place to take on water and there is a dump station. It would be worth a couple of days' stay for sure. We went out past the fee station. 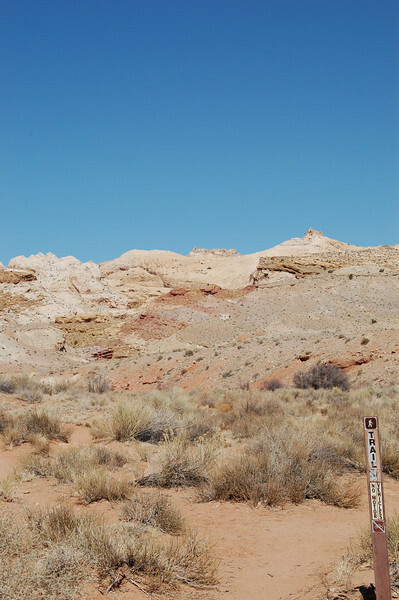 But before exiting the park, there is a sign pointing to Little Wild Horse Canyon. We took the dirt road five miles to the trailhead. 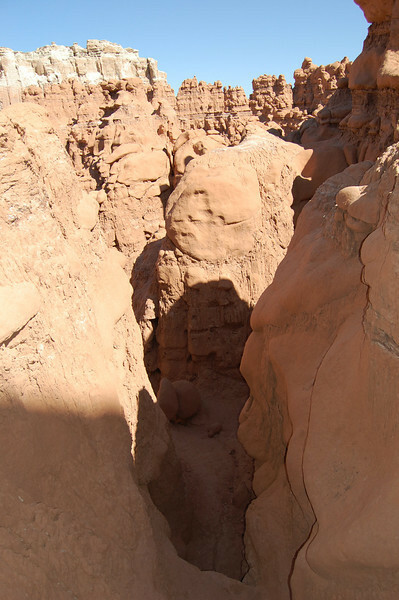 There is a short blurb about this canyon on the state park website. 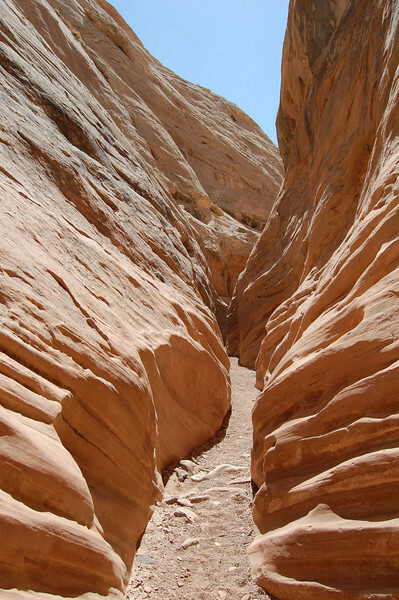 And after doing a little research, we had to do the hike through what is billed as one of the best slot canyons in Utah. 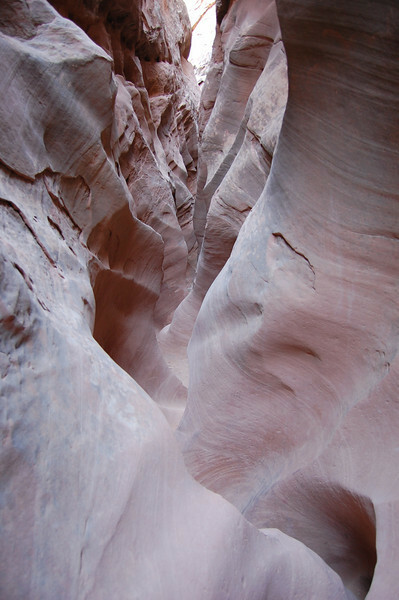 Here is a website with some good information about this canyon hike: Climb-Utah.com. 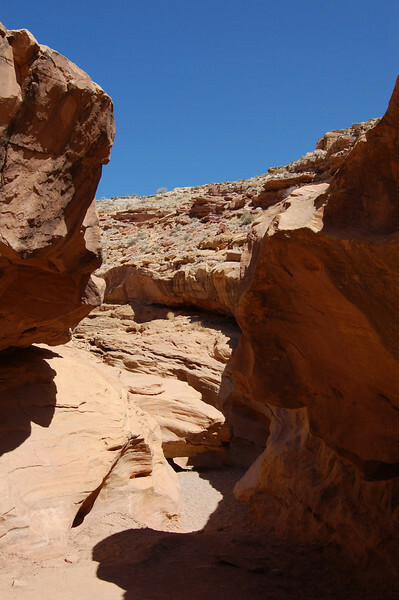 You can do a two-canyon, 8-mile loop, but we opted just to do a 6-mile roundtrip up through the slots of Little Wild Horse and then back. 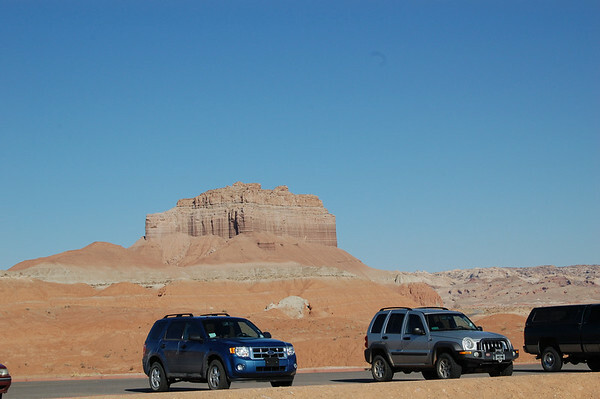 There were actually more vehicles at the trailhead parking area than there were in Goblin Valley State Park. Little Wild Horse is clearly a popular hike. 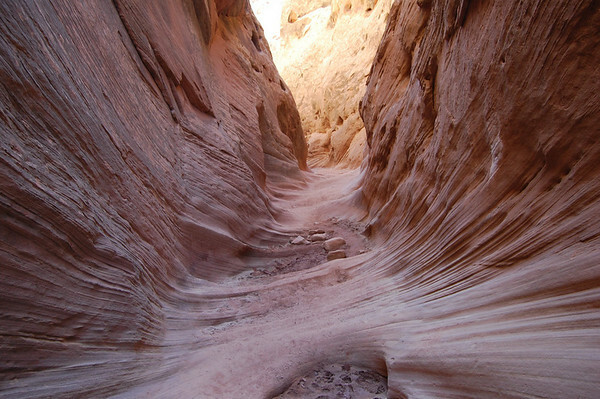 From the trailhead, you walk about a half mile up through a wash. Eventually you come to a dry waterfall. 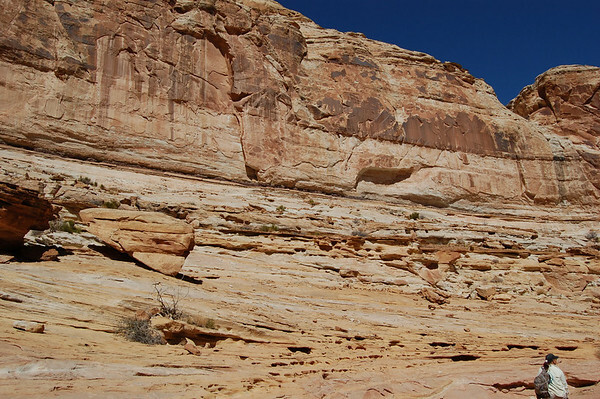 Scrambling up and over or around that ledge is the hardest part of the hike. But it shouldn't deter most physically capable hikers. Past that point about 100 yards is a fork. To the left is Bell Canyon and to the right is Little Wild Horse. 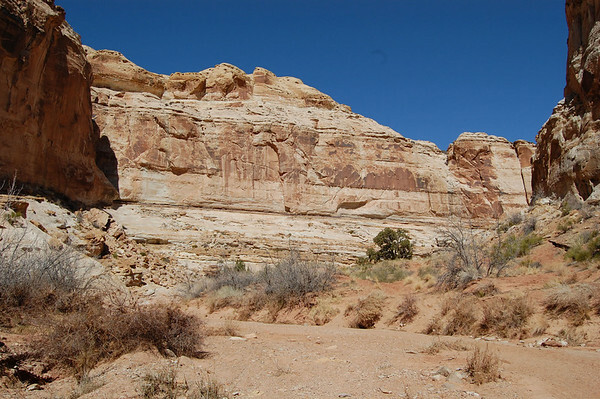 We headed to the right as Little Wild Horse is regarded as the better of the two. 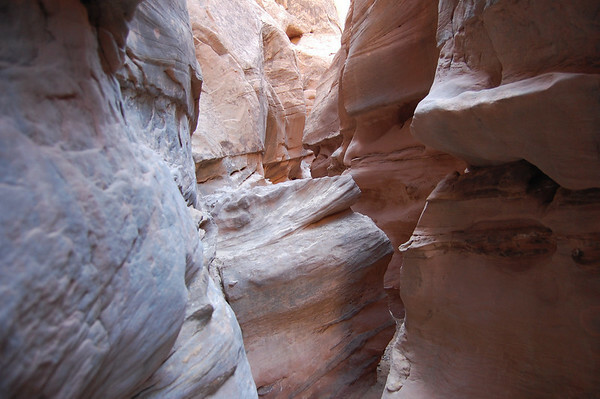 We stepped into the narrow canyon where the walls were not yet high and the sun was shining. 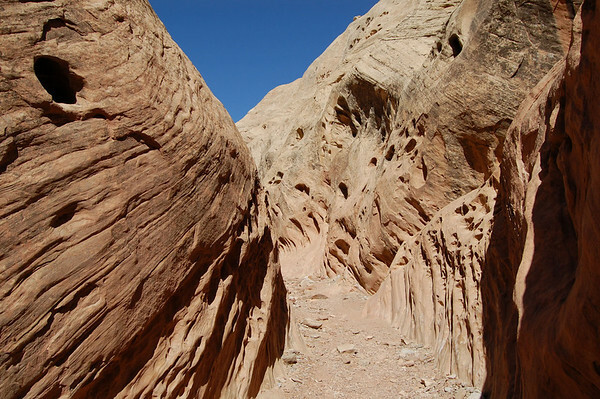 The hike was through a wash that was a combination of coarse gravel, fine sand, and rocks. 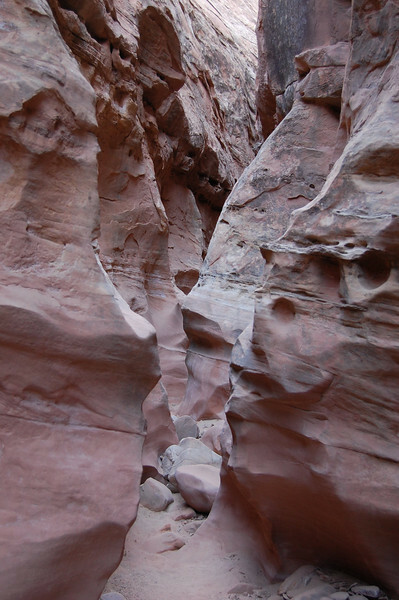 As we proceeded, the canyon narrowed and the walls got higher. And the contours became increasingly interesting. Then it got even narrower. The sun wasn't shining into the slot as we negotiated our way around the obstacles. We eventually came out of the narrowest section. But there was more to see. 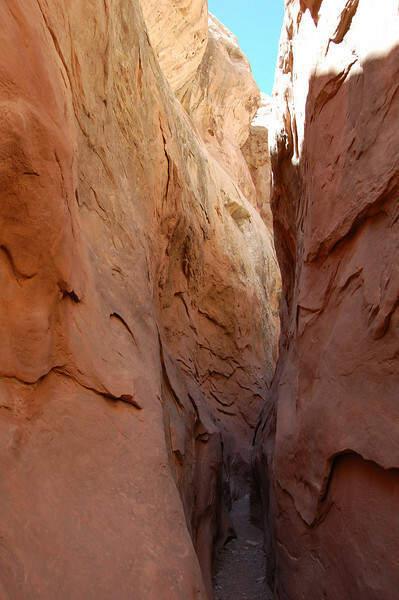 We finally exited into a large opening where the slot canyon appeared to end. It was a great place to take a break. We climbed up on the warm rocks, had some snacks, and took a nap. We were occasionally disturbed by the crunching of the gravel in the wash from other hikers. But it was so beautiful and so peaceful. or returning. Stopping there and going back would make the hike about 6 miles roundtrip. 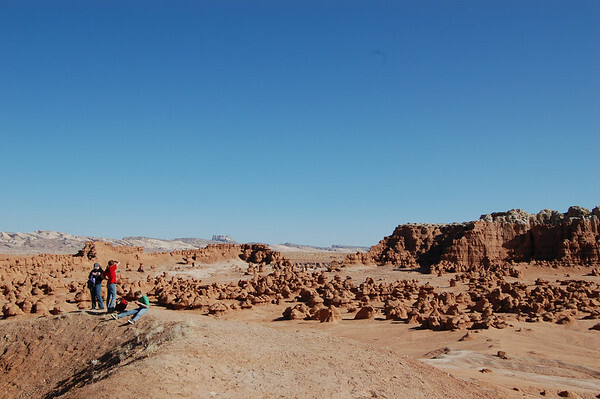 Since we had done quite a bit of hiking at Goblin Valley, we decided to go ahead and go back. The return was just as much fun and interesting. I still stopped and took pictures as I couldn't remember if I had done it on the way in. Wow! That was really fun. 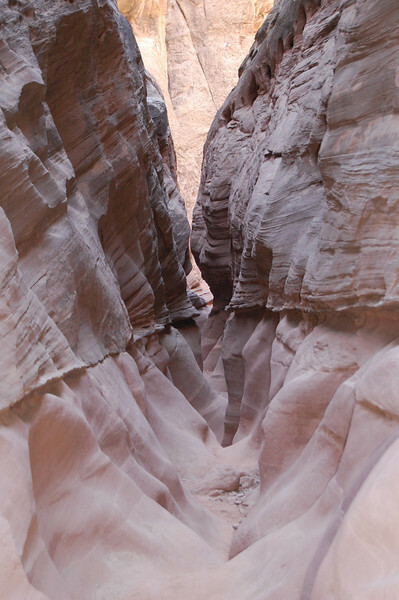 It's not a particularly difficult hike. There were lots of families and a few people older than us. You do have to be careful as it would be easy to sprain an ankle or worse if you step wrong. We were back at the Jeep around 4:30. I wasn't looking forward to driving the two hours back to the campground, but it was certainly worth the trip this morning. 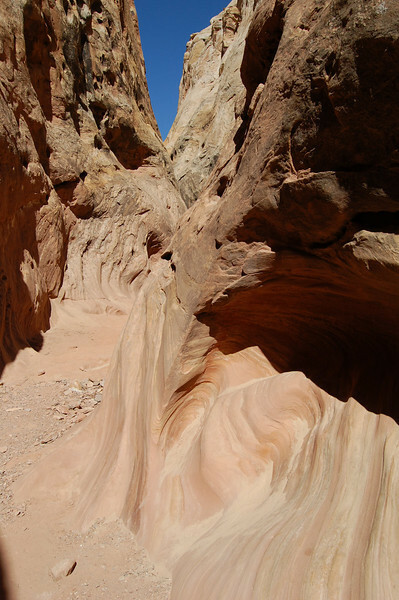 Little Wild Horse Canyon was our first "real" slot canyon, and it certainly made us want to do more. 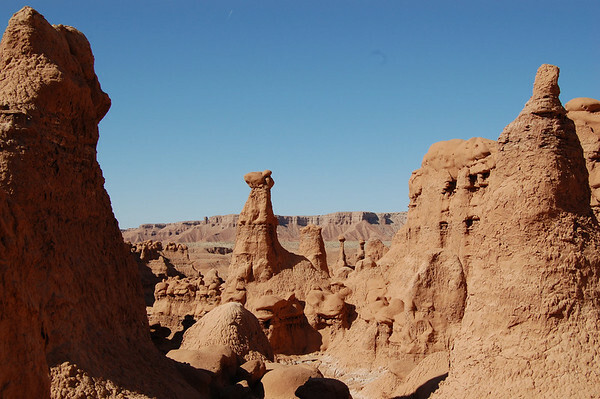 If you are traveling on I-70 west past Green River, consider dropping south about 40 miles and visiting Goblin Valley State Park. 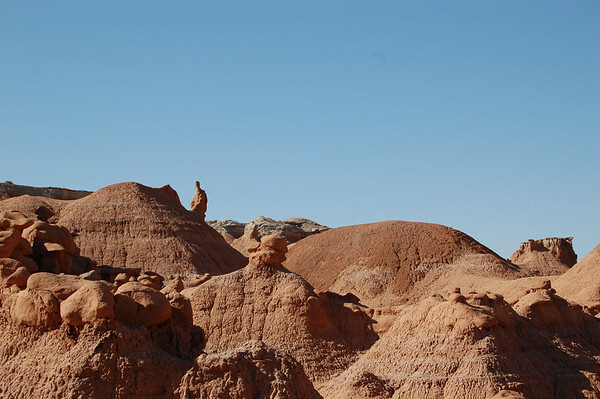 And if you are up for hiking, drive a little bit farther and see Little Wild Horse Canyon while you are in the area.